I walked into my piano lesson. I couldn't wait to see what I would be doing. The first thing my piano teacher said was, "Let's choose an exam piece to learn." I stared. Had I heard her right? Did she say exam piece? Even though Imogen and Charlotte have done lots of exams, I have never done one in my life! It seemed that I had heard her right. My teacher opened up a music book and sat down on the stool to play some pieces for me to choose from. I listened eagerly. I couldn't believe that I was going to do an exam. As my teacher finished the last piece she turned to me. "Which did you like best?" she asked. I thought about it and then turned the pages over to my favourite piece. My teacher played the first bit to make sure it was the right piece and then turned back to me. "Your turn." I sat down at the piano and started to play. The piece was much easier than I had thought it would be and soon I had finished the first page. After my lesson I ran over to the car where Mum was waiting. "I am going to take an exam," I called, jumping in. She smiled. "I bet you can't wait." When I got home I told everyone else my news. They were all very impressed. "I told you Christine would want you to do an exam, didn't I," Imogen said. I grinned. I hadn't believed her at the time. Mum is right, I can't wait. It will be a lot of work, but it will be worth it. This is what I have always wanted. 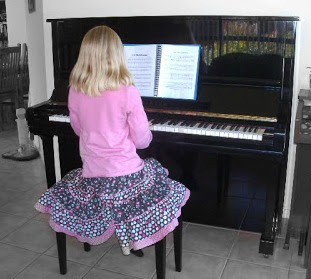 I play the piano too and I have had 2 exams so far. I will be doing my 3rd very soon! Its wonderful that you are learning to play the piano! Its so much fun! I wish you luck in your very first exam. I'm sure you will be an amazing piano player! I love your new blog name, Sophie's Stories. sounds like Fun! also, that used to be my skirt! Thanks! I loved that skirt. I didn't want to pass it on!